No, this isn’t a months-early Halloween-themed post. It is a months-early preview of a tool that could upend the almightly WordPress as the default blogging platform. This is news to personal bloggers and corporate bloggers alike. And it is called Ghost. WordPress’s original functionality — blogging — has become overshadowed and bloated by other features. Blogging has specific needs. Enter, Ghost. Ghost will emphasize aesthetics and usability. For example, the two-pane interface will show Markdown language on the left and a live preview on the right. Gone are the days of flipping back and forth for formatting and display issues. Ghost will also feature simplified dashboards for both content management and statistics that reduce drill-down hunting for important metrics. Moreover, it will ship with social-sharing tools included. This will be an improvement over managing an unwieldy assortment of plugins. One aspect of particular interest to me, and probably you, too? How Ghost will manage multiple editors and authors in an online newsroom format. Here, Ghost has the most potential to serve blogs that are scaled beyond solo bloggers. Here at SixEstate we manage multiple newsblog sites, and Ghost’s innovation in this area will be exciting to watch. 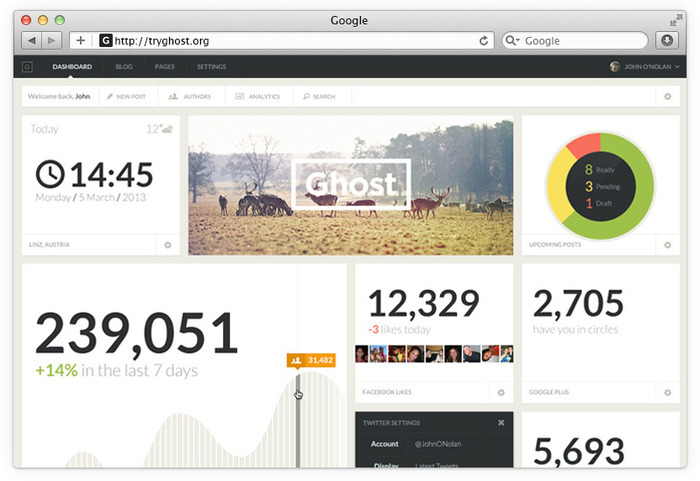 Like WordPress, Ghost will be free and open-source. This means an entire universe of products, services, consultants, extensions, apps, and other (for profit) add-ons will arise. That’s exciting because it will mean a new generation of tools and, hopefully, more people blogging. One final thing to point out, as evidence of a shift in thought: Ghost is being developed as a nonprofit. “Why should you care? It means that no one owns shares of monetary value in the project. We’re building Ghost because we want online publishing to be better. We want to make decisions focused on that goal, not on building a startup that we can sell to Facebook for $1billion,” writes John O’Nolan of his work on Ghost with co-founder Hannah Wolfe.